Your hallway is the first part of your home you see when entering. A well thought-out design helps make an impression. Hallways are crucial to the look and feel of a house, acting as a ‘welcome home’, a connection between rooms and a vital storage area for everything from shoes and umbrellas to coats, gloves and scarves, plus all kinds of things that don’t have a specific place elsewhere. In a narrow hallway, pale colours emphasise a sense of space. Specialist light-reflecting paints may help, or look for patterned wallpaper with a metallic sheen, and add large mirrors. Choose an extra-tough paint if you expect wear and tear, or add a dado rail and clad the walls below it with panelling, tiles or hard-wearing vinyl wallpaper. Period-style tiles or embossed wallpapers suit older properties with period features. Flooring should be non-slip, durable, dirt-resistant and easily maintained. Darker colours are generally better than pale, especially if you have pets and children. Stone, ceramic or quarry tiles, or Victorian encaustic tiles, are all easy to care for, while solid wooden boards or parquet simply require regular polishing or waxing. Linoleum or vinyl can look impressive but carpet is more problematic. Choose a colour or pattern that won’t show the dirt, and make sure it’s suitable for a hallway: an 80:20 twist classified for heavy domestic use is often the best. Light in the hallway should illuminate steps, stairs and thresholds clearly and help provide an even flow of light. With a high ceiling, a beautiful chandelier, or a series of pendants, looks great; otherwise, a row of downlights set into the ceiling is better. Avoid protruding wall lights in a narrow hall where they become obstacles. Built-in storage makes the most of available space. Shallow, floor-to-ceiling cupboards with doors painted the same colour as the walls, or mirrored, are discreet but hold masses. Alternatively, use free-standing cupboards, sideboards, tables, benches, hooks or racks that suit your layout and style. Somewhere to keep post and keys is useful: perhaps a bowl and rack on a console table, radiator cover or shelf, or a small, wall-mounted cupboard and hooks. Windows will benefit from shutters, blinds or curtains, with fabric co-ordinated with cushions or upholstery. A long, thin floor runner works beautifully on hard flooring. Fit shelving above doorways or above head height along the hall’s length for books and delicate items. And, finally, add a personal touch with paintings, photographs or other artworks. 1 Custom-made Digitalis Bluebell roller blind, from £38.68, English Blinds: 0121 439 6770; englishblinds.co.uk. 2 Tjusig bench with shoe storage, from £35; Tjusig hangers, £10 each; Ekby Valter brackets, £2 each; Ekby Järpen shelves, £8 each; Söften rug, £20; all Ikea: 020 3645 0000; ikea.com/gb. 3 Antique hook rail, £18; doormat with three stars, from £12; Chilson hallway bench, £165; Farringdon boot jack, £15; Farringdon umbrella stand, £65; all Garden Trading: 01993 845 559; gardentrading.co.uk. 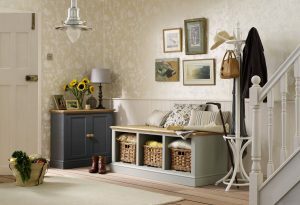 4 Millbrook wide cupboard, from £789; Richmond hall bench with baskets, from £499; both The Painted Furniture Company: 01285 656 041; paintedfurnitureco.co.uk. Previous Post:The Great Cover Up!